Celebrating 40 years since their development, Osborne’s Stanfield® Heat Pads remain the safest, most reliable and economical heat pads for baby pigs in livestock production facilities. 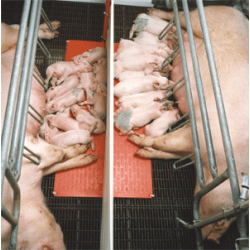 Producers all over the world rely on Osborne’s heat pads to create an ideal environment with controllable heat for their newly farrowed piglets. Stanfield Heat Pads were developed in 1973 as the first under-animal heater for use in intensive pig production facilities. An Osborne Stanfield Heat Pad provides a heated surface that infant and juvenile animals lie on or against. The pads maintain a consistent temperature approximately 35° F above ambient air temperature. Stanfield Heat Pads are strong enough to withstand tough abuse and their ultra-thin profile keeps sows from pushing against them, while allowing piglets to comfortably lie partially on the pad if their body temperature rises. They are water-resistant and CSA certified safe to operate. Made of flame-retardant, non-porous materials, cleaning is easy and hygiene is assured. They are available in numerous shapes to fit a variety of farrowing stalls, and come in large sizes to accommodate up to 30 pigs in Nursery buildings. For more information, or to order, visit osbornelivestockequipment.com or call Osborne Customer Service at 1-800-255-0316.